Tena® Pad Heavy Long is perfect for those who require or prefer protection for heavy, continuous urine loss, with a longer length for extra security. May be preferred by larger or taller individuals. Heavy Long has a specific design to ensure a great fit by following your body's natural contours. There’s also a soft, cloth-like outer layer for extra comfort and a double pulp layer for increased absorption, enabling you to enjoy your day with complete confidence. Soft, quick-dry topsheet pulls in liquid fast to keep you dry. Dry-Fast Core™ with super absorbent microbeads wick away and help trap in liquid quickly for effective leakage protection. Cushiony, side gathers provide a fit that conforms to your body. Advanced odor protection pH balanced to fight odors. Adhesive strip for secure fixation in your own underwear. Individually wrapped for convenient, discreet portability. Now infused with more microbeads. 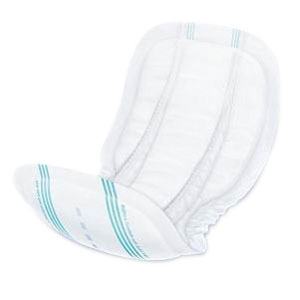 TENA Serenity Ultra Thin Light Absorbency Pads 10"
Compaire Contoured Ultra Booster Pads, 13" x 24"